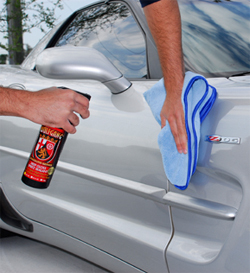 Best spray sealant,also recommended as a quick detailer. After using the Wolfgang Fusion wax, sprayed this sealant on the hood of my new car. I was stunned at the ease of application and removal, and even more pleased with the shine. Now, the question is, how long will it last? Also, read confusing information with some saying to apply the Spritz before topping it with the Fusion wax, and others saying to apply it after the Fusion wax application. Have been detailing my cars for 55 years, and this may be the finest product I've ever used. When applied the next day following the application of the Wolfgang Fuzion Spray Wax, the Wolfgang Deep Gloss Spritz Sealant is an excellent choice for bringing out the superior shine, and deep slick finish to your vehicle. I used these two products after purchasing a 2018 Buick Enclave with the Satin Steel paint color option. I didn't imagine that I could achieve the results that I did, simply because this color is not a particularly deep, dark color that would lend itself to providing that maximum desired shine. However, the results were amazing, even on a brand new vehicle with a metallic paint finish. I am a new customer, but will remain a loyal customer, so long as the Wolfgang products remain on the market. I highly recommend. ProsDeep gloss shine that provides an easy on, easy off process. When used in conjunction with the Fuzion Spray Wax, the results are phenomenal.